To follow this tutorial you will need Node, npm and the React Native CLI. Some knowledge of mobile development with React Native will be helpful. This tutorial will show you how to build your own realtime Android and iOS chat using React Native, Gifted Chat and Pusher Chatkit. Now that you have set up your project with modules, you need a Pusher account. It's a very simple process. Simply go to pusher.com/chatkit and sign up for the public beta. You can do so using your Google account, GitHub account or regular email and password. Once you have signed up, you will be redirected to the dashboard. Here, you need click on the CREATE button below Chatkit. A dialogue box will appear asking you to give your instance a name (for example, MyFirstChat). When you are done, click CREATE and you have your first Chatkit instance ready. You can find the instance on the left menu bar of the dashboard. If you go into the dashboard of the app, you will find several tabs pertaining to the Chatkit instance. For this sake of this tutorial, we won't be needing all of them. Start by exploring your keys section. You will find your Instance Locator here, along with Secret Key. You will be needing them when we back to coding. 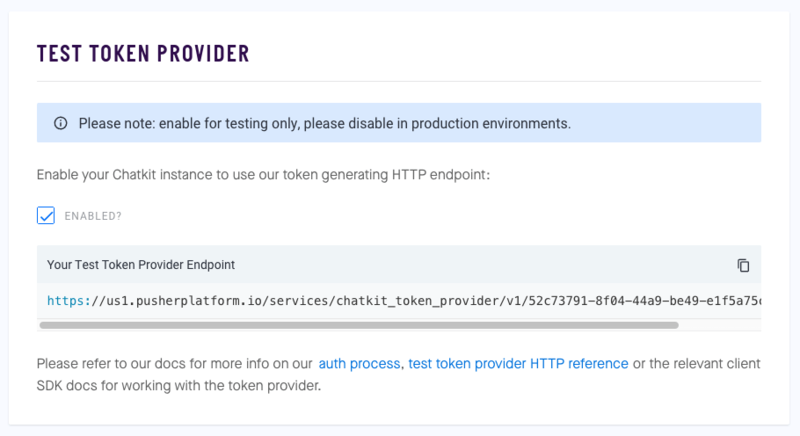 Next, go to the TEST TOKEN PROVIDER section. You will find the test token provider here. By default it is disabled. But for our testing we will need it, so enable it. You will see an endpoint for test token provider show up. Basically, every user has to be in at least one room and every room needs to have at least one user. If you satisfy this, you will be able to send and receive messages for the user-room pair. So, let's try doing that. Here we have hooked a room subscriber to be trigger dynamically on an incoming message event (onMessage). It will fire an event that alerts the data coming from Pusher’s trigger. Wanna test it? There are several ways to send a message to a user in any given room. You can create a backend server in any of the wide range of frameworks supported by Pusher Chatkit and use the sendMessage function. Or you can send it from a the INSTANCE INSPECTOR section of the dashboard itself. So let's go back there and open the INSTANCE INSPECTOR section. 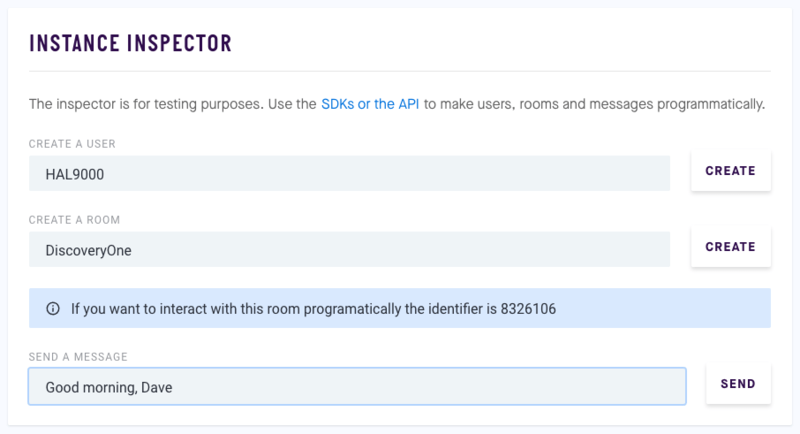 There you will find fields to input the name of user, room and a text message. Create a new user called HAL9000 for the room DiscoveryOne and send the message Good morning, Dave. At this point, you should find an alert on your emulator showing the data that you just sent. But we want this message to be integrated with our Gifted Chat module, right? We want any incoming message to show as a message in out chat window. Let's see how we can pull that off. We can create a method, say onReceive, and make it handle the incoming data such that whenever there is a new message from the room DiscoveryOne and user HAL9000 it would append it to the existing chat window. This onReceive method looks good but we need to bind it with our existing event subscriber. So instead of alerting the data, let's pass the data to this function. We can do so by simply replacing alert and writing onReceive instead. And voila! 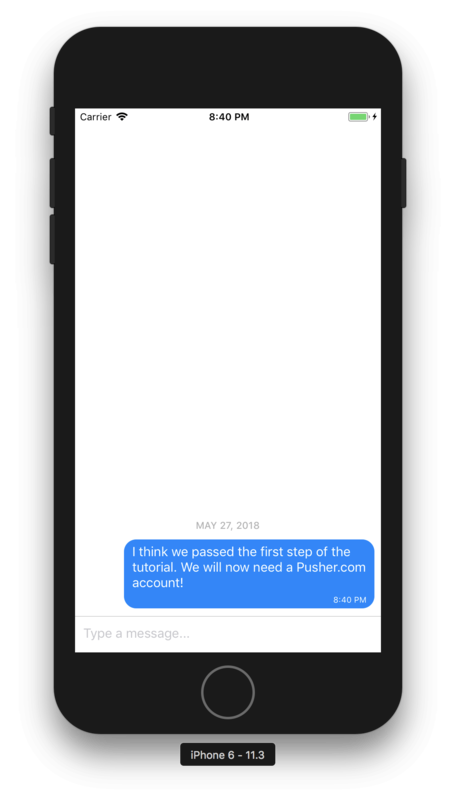 You have your own realtime chat built with React Native using Gifted Chat and Pusher Chatkit. 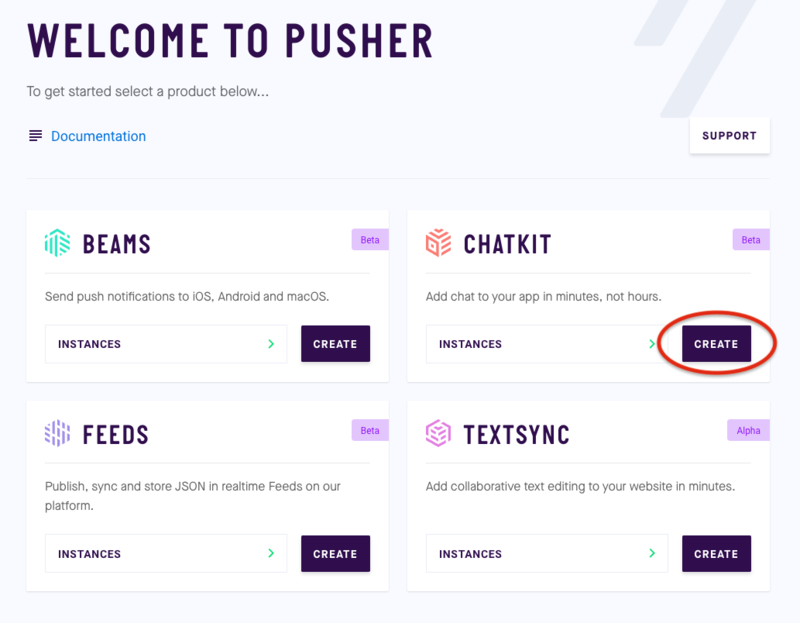 The Pusher ecosystem offers several realtime solutions. You can find more documentation details here.